Dry oak, oak-hickory, or even beech-maple forests, prairies, and thickets between forests and prairies; in shaded ground on a limestone bluff in Delta Co., growing near V. pedatifida. An extremely variable entity, often with many leaf forms on the same individual (at the same time or as the season progresses), treated as a broad complex to include Michigan plants previously referred to V. triloba Schwein. as well as V. subsinuata Greene, this is probably of hybrid origin with V. sagittata × sororia or V. pedatifida × V. sororia being the most likely primary crosses involved. The eager student should consult Ballard (1994) and Gil-ad (1997) for further information. MICHIGAN FLORA ONLINE. A. A. Reznicek, E. G. Voss, & B. S. Walters. February 2011. University of Michigan. Web. 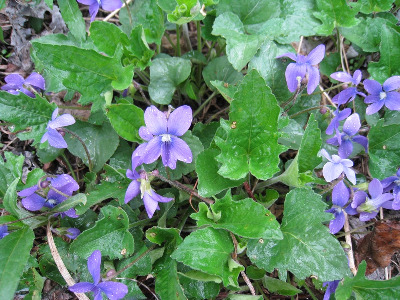 April 19, 2019. https://michiganflora.net/species.aspx?id=2789.